Sure, there are plenty of miniature-sized grills on the market. Sure, there are plenty of miniature-sized grills on the market. 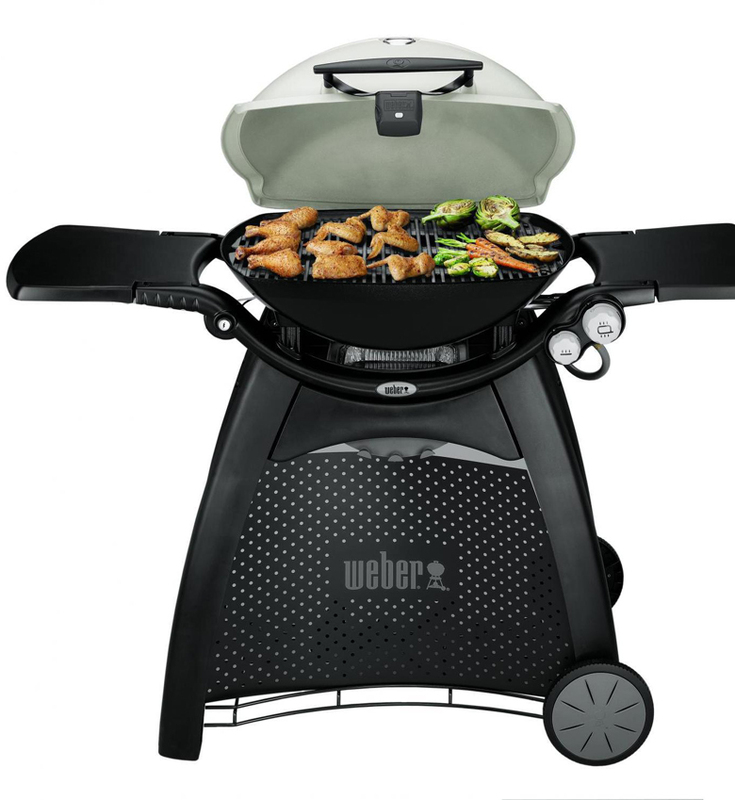 But few compare to the Weber Q 3200 an ideal option for those confined to tiny living spaces. The Weber brand traces its roots back to 1893 and introduced its first barbecue more than 65 years ago. So you know you’re getting a quality piece of equipment, and this portable and petite model is no exception. Available in natural gas and 20-pound propane versions, it measures approximately 4.6 feet tall, 4.2 feet wide, and 2.5 feet deep. Its compact size makes it an inconspicuous addition to any patio, terrace, or balcony — but it certainly packs a punch, producing 21,700 BTU an hour and heating 393 square inches of cooking space. In terms of design, the grill gets high marks for its double burners and lightweight aluminum body and hood (which houses a nifty built-in handle light). The porcelain-enameled, cast-iron cooking grates heat quickly and evenly, and make cleanup a no-brainer. Firing it up is as simple as pushing a button, thanks to the electronic ignition. It also features a bevvy of thoughtful innovations, such as ergonomic side handles, removable catch pan, built-in thermometer, and infinite control burner valve settings that let pit-masters set and lock their preferred grilling temperatures. Large pop-up tables on either side make prep work a breeze, and fold away quickly when not in use. There’s even a warming rack and optional griddle (which is purchased separately but totally worth the $50 investment). [post_ads]Whether you’re looking to cook breakfast, lunch, or dinner, this grill is a jack-of-all-trades. The split grates make it effortless to cook a combination of foods at once, and the grill can handle everything from bacon and eggs on the griddle, to seared steaks and shish kabobs. You can also use it to slow-cook ribs, roast a 20-pound turkey to perfection, or even smoke a brisket with the built-in smoke tube. Any drawbacks? Just a couple. The Q 3200 is mounted on a wheeled cart for easy transportation, but at 83 pounds it’s not exactly “portable,” so though small in size it’s better suited for cramped outdoor spaces than for lugging to the beach or park on weekends. And although the Weber is reasonably priced for the quality, there are plenty of larger barbecue models with even more features available at very comparable price points. 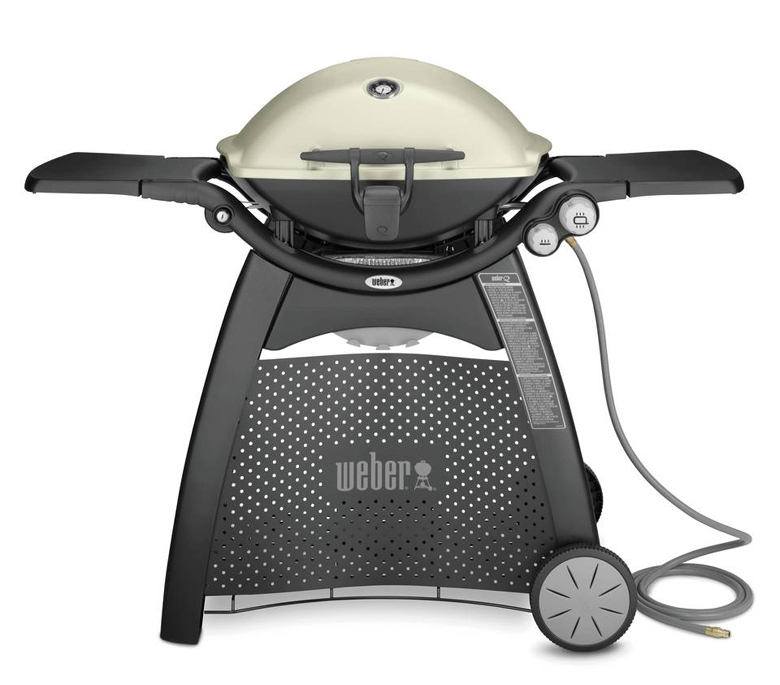 Overall, the Q 3200 is a cleverly designed, efficient, and versatile grill that upholds the Weber reputation with pride. So while it may not be ideal for those with the luxury of a full backyard, the common city dweller with limited space will be hard-pressed to find a better bang for their buck.